Olyn Seran is a Dunmer archer, and the master trainer in Conjuration. He can be found with his fellow daedric worshippers Amir and Yushi at Molag Bal's Shrine. Olyn Seran will spend day and night worshipping at the shrine of Molag Bal. He divides up his time there by either wandering around the shrine or sitting on one of the benches at the shrine. He will offer training all day, every day. He is armed with an enchanted leveled bow at level 3 or above, with iron arrows as ammo. He wears middle class clothing, specifically tan linens, a pair of doeskin shoes and a quilted doublet. Approaching Olyn Seran before starting the Molag Bal Shrine Quest will earn you the greeting "Fools must be separated from their illusions before they will come to Him." Him referring to Molag Bal. The two advanced trainers in Conjuration, Arentus Falvius and Alberic Litte, will point you toward Olyn when you ask them about master training. Arentus will point you toward Olyn with the words: "If you want to train further, you'll have to seek out someone else. There's nothing I can teach you. I've heard of a Daedra worshipper named Olyn Seran. Very powerful, and might be helpful, if you can find him. 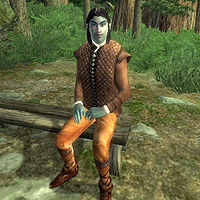 I heard he had to flee Morrowind, and is now hiding out in the forests of Cyrodiil. If there are other cultists out there, he's probably with them." Alberic will give you a similar reference to Olyn when asked about master training, although mentioning he would not go near the daedric worshippers: "I've heard that there's a powerful conjurer off in the woods someplace, worshipping Molag Bal. Olyn Seran, I think his name was. I personally wouldn't go looking for him myself, but you might keep it in mind if you ever run across him." If you ask either trainer about master training after you have already been told to seek out Olyn, they will provide you with a brief reminder: "Find Olyn Seran. Look for him at a Daedric Shrine; that's where he probably is." Asking him about training after meeting the necessary requirements for master conjuration training will be rewarded with the response "You would seek training from me? Well, then my request is small. Prove to me that you are capable of serving Molag Bal in your own way. Summon a Faded Wraith right here, before me. When I have seen it with my own eyes, you shall be worthy of my teachings." Asking him about training again before successfully summoning the Faded Wraith will have him respond "Until I see you summon a Faded Wraith here before me, you shall get no training from me." After successfully summoning the Wraith he will be surprised by your Conjuration ability: "I am impressed. You have proven yourself worthy, and have earned my respect. What I know, I shall teach to you for a fee." He will thereafter be available for master training at all times. This page was last modified on 16 November 2018, at 00:50.